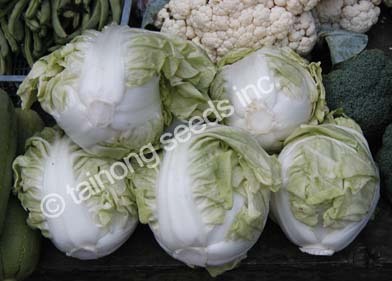 Chinese Cabbage Napa 包心大白菜 | Tainong Seeds Inc.
Chinese Cabbage Napa sold at a Taiwanese open market vegetable stand. 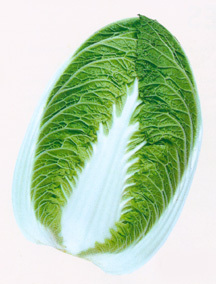 Tropical napa varieties, such as seen above, are smaller, round in shape and highly tolerant to heat. Extra early maturity, 50~55 days from sowing. Dark green outer leaves with light yellow inner leaves. Oval shape with excellent overwrapping. 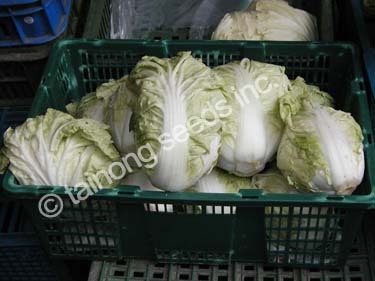 Summer use, heat tolerant Taiwan Napa type. 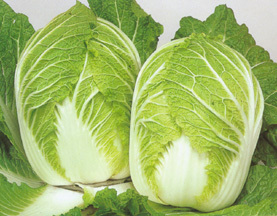 Wide adaptability with strong disease resistance. 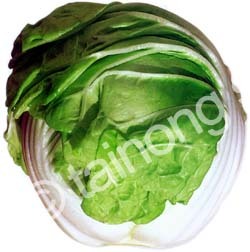 Round shaped head with medium green leaves. ~60 days to harvest, ~1.5 kg in weight. 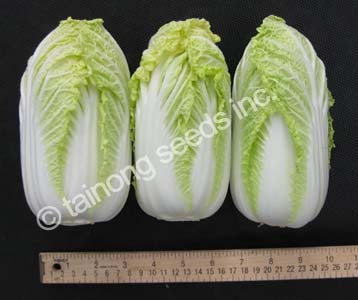 Medium early maturity, ready 70~75 days, weight 5.5~6.5 lbs. 16~18 in tall. 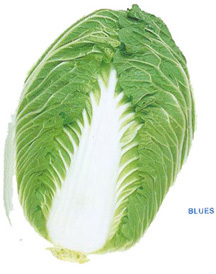 Strong tolerance to cold and many diseases. 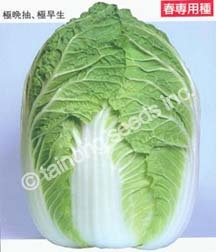 Slow bolting type for spring/autumn sowing. Mid-early maturity, ~65 days after sowing. 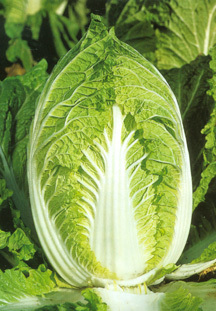 Medium green outer leaves with light yellow interiors. Blocky, barrel shaped heads weigh ~5.5 lbs. Best harvesting season from fall to early winter. 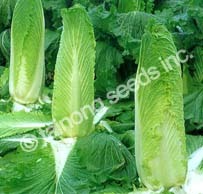 Tolerant to Virus, Soft rot and leaf spot. Very strong against cold weather. Slow bolting hybrid for Spring/Autumn sowing. Early maturity, 60~65 days from seeding. 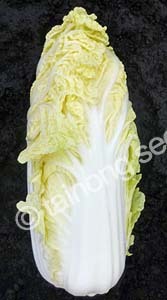 Big barrel shaped head, beautiful green outer leaves with yellow interiors. Early maturity, very late bolting characteristic suitable for spring & autumn sowing, ~60 days after sowing. Barrel shaped heads with deep green outer leaves and rich yellow interior hearts. Heavy yielder, easily produces 5~6 lbs heads. Early maturity, ~60 days after sowing. Medium sized plants with dark green leaves. Blocky, barrel shaped heads are ~5.5 lbs. 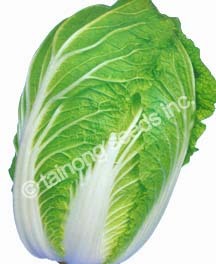 Compact outer leaves suitable for dense planting. 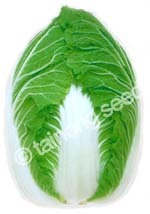 Late bolting variety suitable for early spring to spring sowing. Extra early maturity, 50~55 days after seeding. Widely adapted and utilized variety. Attractive, medium sized, barrel shaped heads, well wrapped and uniform. ~62 days. 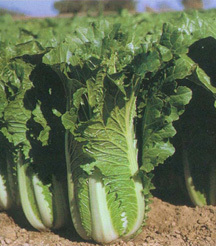 Tolerance to turnip mosaic virus, tipburn and bolting. Weight is 4~5 lbs. Maturity in ~67 days. Club root resistance, tolerant to Tipburn and pepperspot. Harvest Fall to early winter. ~65 days after sowing. 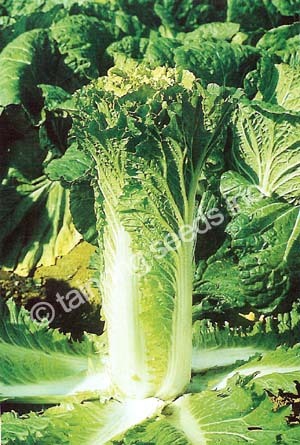 Tolerant to Virus, Soft rot and Downy mildew. Avoid dry conditions at heading stage. Medium maturity, 80 days after sowing. 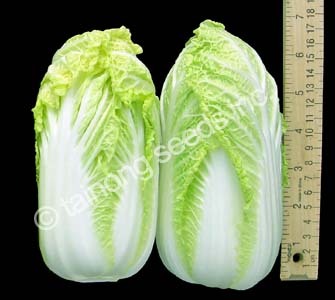 Head size is 2.0 kgs, bright green, cylindrical, 45 cm tall. High tolerance to multiple diseases. Extra early, ~57 days after sowing. Best for spring to early summer in areas where bolting is a problem. Good also for summer to early winter. 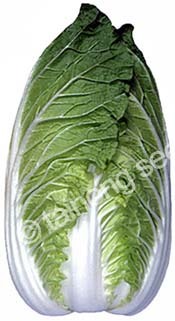 Highly tolerant to virus, Downy mildew and Bacterial soft rot. Mid early maturity, 65~70 days after sowing. Very tall, upright heads cylindrical in shape. Good wrapping habit, heads ~3 kgs. 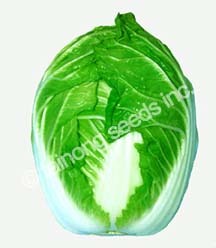 Cold tolerant for fall and late fall crop. Close planting produces smaller sized heads.